The short answer is, not a lot. However, I shall try to summarise what is known so far, leaning on input from experts including the British Geological Survey (BGS), Dr Steve Hicks (Southampton University) and the two Stuarts from Edinburgh University (Professor Haszeldine and Dr Gilfillan). My own contribution, presented below, is to tie in the earthquakes to the subsurface faults in the locality. A sequence of 11 earthquakes began in Surrey on 2018 April 1 (I am pedantically using the descending date-time order preferred by seismologists and astronomers, avoiding the ambiguity of 1/4/18, which is rendered illogically as 4/1/18 in America-speak). 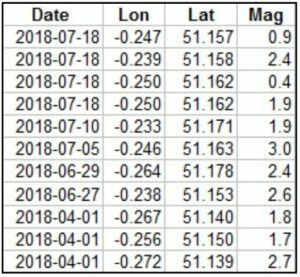 Eleven earthquakes at Newdigate recorded by the BGS between 2018 April 1 and 2018 August 12. The latest one was on July 18. Mag is the local magnitude (click to enlarge). The first quakes, a magnitude 2.7 plus two small aftershocks, were poorly located. The BGS installed two local seismometers in mid July; these recorded the four events of 2018 July 18. Since then the BGS has installed a further three seismometers, but there have been no further events to date (2018 Aug 12). Steve Hicks has relocated the epicentres. Here is the result of one of his two methods; this one uses a Bayesian relocation method, which yields a better depth estimate, but it is said to be somewhat experimental. 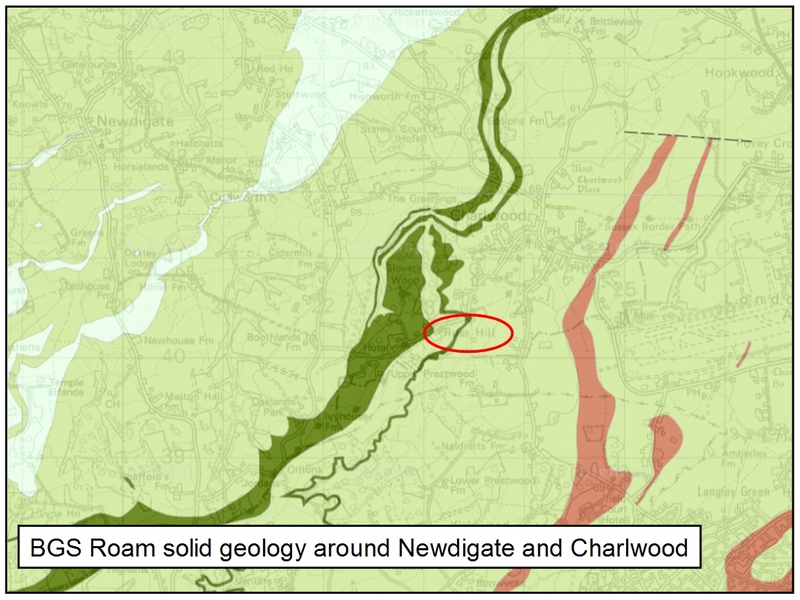 Relocation of the earthquakes between Newdigate and Charlwood by Steve Hicks. Profile BB’ is discussed below (click to enlarge). The nearby seismometers are REC60, a private seismometer belonging to the Raspberry Shake worldwide network, and the two original temporary stations installed by the BGS; HORS and RUSH. 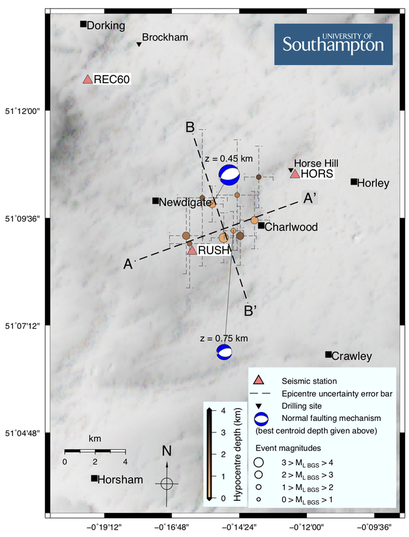 The two ‘beach balls’ indicate solutions with depths of 450 m and 750 m, which are unusually shallow for natural earthquakes, but which lie within the operating depths of the wellbores at Brockham and Horse Hill (shown by the inverted black triangles). The line of intersection of the four sectors on each beach ball indicates the trend of the calculated fault which slipped to produce the tremor in each case. Their alignment with a white sector uppermost indicates normal faulting. The calculated fault trends are ENE-WSW and E-W, respectively, which accords well with the known trend of deep faults. A comparison of the profile BB’ with available seismic reflection data is shown below. Profile BB’ indicates the depths of the hypocentres, projected onto this vertical plane. The hypocentres fall into two groups, which I have highlighted in Hicks’s diagram below with blue ellipses. Hicks’s profile BB’ showing the earthquakes falling into two groups (click to enlarge). The four best-determined locations, shown in green, lie at 600 to 900 m below sea level. This information is combined with the geology in a section below. “the data that I’ve looked at shows that these tremors were actually clustered around quite a large fault which comes to the surface around Russ Hill” [recording 2:03 to 2:14]. So what is the evidence for this fault? I have examined the BGS geology maps for the district around Russ Hill. Firstly, here is the printed Horsham sheet 302 at 1:50,000 scale. 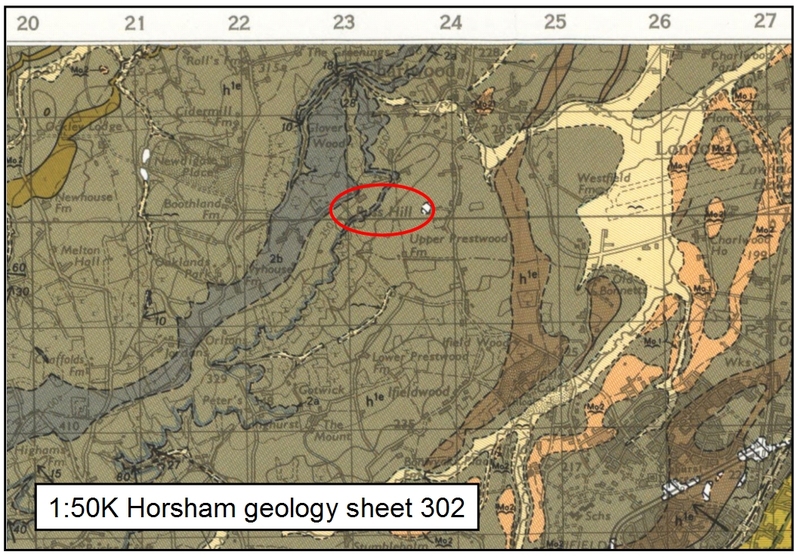 BGS 1:50K Horsham solid and drift geology sheet 302. Russ Hill is highlighted by the red ellipse (click to enlarge). I have circled Russ Hill in the map above. Solid geology is in dark shades, superficial deposits in light tan and buff. I see no evidence for outcropping faults. Just in case this map, from 1972, had been updated, I also looked at the online BGS Roam data (available to research institutions through EDINA Digimap). This map shows solid geology only. BGS Roam solid geology (online) with Russ Hill highlighted by the red ellipse (click to enlarge). Once again, no faults are shown anywhere near Russ Hill (circled in red). I therefore challenge Mr Sanderson to produce evidence for his alleged “large fault“. If he cannot do so, the impression seems to be left that he is once more prepared to come out with any old nonsense in order to defend his company and support the share price. “The earth’s natural geological fault lines in the deep subsurface at Brockham run east – west. However, the epicentres of these earthquakes were to the south of the site. Therefore it is physically impossible for the Brockham field to create an earthquake.” [Advertorial in Surrey Live, 2018 Aug 6]. The supposed physical impossibility of a link between underground drilling or injection activity and triggering of earthquakes, averred so dogmatically by these two gentlemen, is contradicted by evidence from the USA, discussed below. Tha map below shows the available 2D seismic database (green lines) superimposed on Hick’s map. Most of the seismic reflection data date from the early 1980s; there are no 3D surveys here. Blue lines with teeth on the downthrown side mark normal faults. 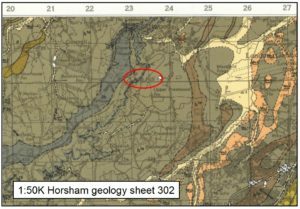 The Collendean Farm Fault and the Horse Hill Fault come from my analysis of the drilling results of Horse Hill-1. Map of available 2D seismic reflection lines in the Newdigate area superimposed on Hicks’s earthquake location map. The orange highlighted line runs parallel to Hicks’s profile BB’ (click to enlarge). Seismic line TWLD-90-15, highlighted in orange, runs parallel to Hicks’s profile BB’ shown above. This line shows a fault zone, the Cudworth Fault, which bifurcates upwards into two separate northerly and southerly strands near the surface marked as C(N) and C(S) respectively. 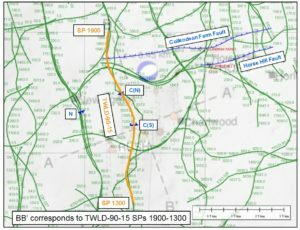 There is also a fault seen on TWLD-90-13, a NNW-SSE trending line through Newdigate, which I have termed the Newdigate Fault, marked with an N on the map. Note that the Cudworth Fault zone cannot correspond to Sanderson’s Russ Hill Fault, because the former is 1 to 2.5 km north of Russ Hill, and, furthermore, does not reach the surface. It is tempting to correlate the Newdigate Fault with the north Cudworth C(N) strand some 1800 m to the ENE, although I have not done so on the map above. 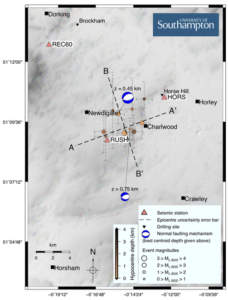 They cannot correlate with the Horse Hill Fault, because (a) the sense of throw is in the opposite sense, and (b) it is known that the Horse Hill Fault dies out 400 to 500 m west of Horse Hill-1. 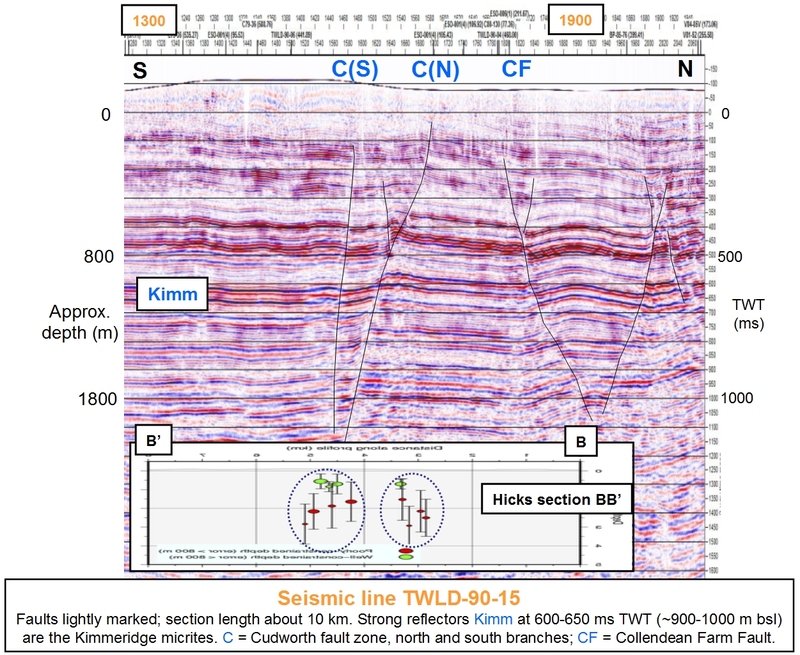 The other seismic lines in the area show an absence of faults in the shallow (0 to 1000 m) subsurface. So the Cudworth and Newdigate Faults must be of limited lateral extent, like the Collendean Farm and Horse Hill Faults. The section below shows part of line TWLD-90-15. South is on the left, so Hick’s section BB’ has been mirrored and scaled horizontally for overlay, to match the seismic data as far as possible. Within the limits of error in locating the earthquake hypocentres, there is a good spatial match between the two groups of earthquakes and two shallow Cudworth fault zones, north and south, labelled C(N) and C(S), respectively. 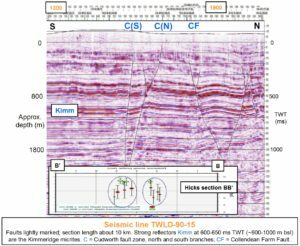 Seismic line TWLD-90-15 with interpreted faults. Vertical scale is in two-way reflection time (TWT); an approximate depth scale is shown at the left-hand side. Hicks’s profile BB’ is positioned below (click to enlarge). The seismic section shows that the vertical throws on all the faults depicted are small, 50 ms or less (60-80 m). This matches the fact that their lateral extent is limited. The Collendean Farm Fault is 7 km long; the Horse Hill Fault is 3 km long, and the Cudworth-Newdigate strands are 4 km long or less, constrained by the surrounding seismic data. However their structure in vertical section, like a negative flower structure, suggests that there may be a component of strike-slip (sieways) displacement. But we don’t as yet know the sense of this component of displacement. Link between the earthquakes and hydrocarbon activity? Neither of the two employees of Angus Energy quoted above seem to understand basic principles of hydrogeology. Mr Hollis’s statement implies that any fluid connection away from the boreholes would only be along fault lines, which, he correctly states, run generally east-west. But he forgets about the permeable horizons in the Jurassic and Cretaceous, and in particular the Brockham reservoir rock, the Portland Sandstone. If the E-W faults are transmissive (a reasonable assumption, and one he makes himself) then injected fluid from Brockham BRX-3 could, in principle, flow south (or north) along the [low– corrected 2018 Aug 16] high-permeability reservoir, crossing through any faults on the way, and aided by confining clays (layers of low permeability) above and below. He cannot argue that re-injecting produced water is simply putting it back where it came from (minus the oil, of course), because produced water from Lydsey has for many years been shipped to Brockham for disposal there. 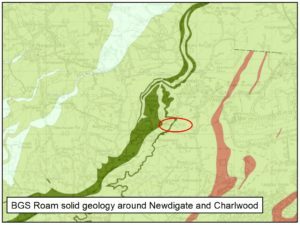 It might also be argued that the distances from Brockham and Horse Hill are too great for there to be a physical connection between injection and the triggering of earthquakes at Newdigate. However, a recent report published in April in Eos, the weekly magazine of the American Geophysical Union, under the self-explanatory headline ‘Fluid injection wells can have a wide seismic reach’, shows that fluid pressure from injection and resulting induced earthquakes can be observed more than 20 km away from the injection well. However, the volumes of injection involved, in southern Kansas, are many orders of magnitude greater than at Brockham. I only mention this article to demonstrate that a fluid connection is physically possible; I am not saying that it is probable that there is a similar link between Brockham injection and Newdigate earthquakes. We simply do not have enough information yet. The several US studies of induced seismicity resulting from produced water injection all concern wells injecting fluid just above ‘basement’, i.e. at the base of the sedimentary pile at several kilometres down. 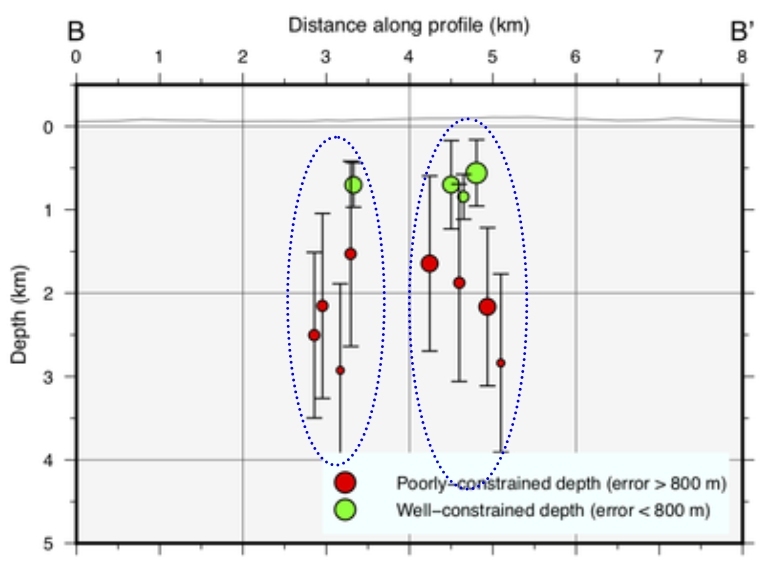 The novel aspect of the Newdigate earthquakes is their unusual shallowness – less than 1 km depth. They may even be occurring at around the transition depth of a few hundred metres where the maximum compressive stress in the rocks is horizontal, and not vertical. This change in orientation occurs simply due to the weight of overlying rock becoming the dominant force the deeper you are. On the other hand, the normal fault sense of displacement of Hicks’s fault plane solutions does imply that the maximum principal compressive stress is indeed vertical, with the minimum stress component being N-S. The effect of fluid injection into permeable rock around a fault which has the potential to slip, thereby increasing the pore pressure, is to ‘take the weight off’ all the stress components, somewhat akin to letting the rocks ‘float’ to a slight degree. So if the fault zone is critically stressed, that is, it is on the point of failure, the increased pore pressure can alter the relationship between the stress components (including shear stresses) in such a way that the fault moves to release the stress, giving us an earthquake. 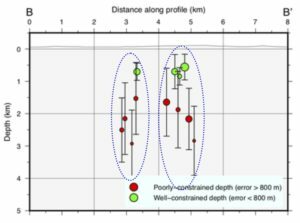 But until we understand more about the local stress field, and have located more precisely where the fault or faults slipped each time there was a quake, we can only make this qualitative assessment. 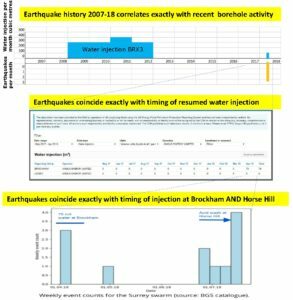 The time chart below, by Stuart Haszeldine and Stuart Gilfillan, shows the temporal relationship between Brockham injection, Horse Hill activity, and the earthquakes. 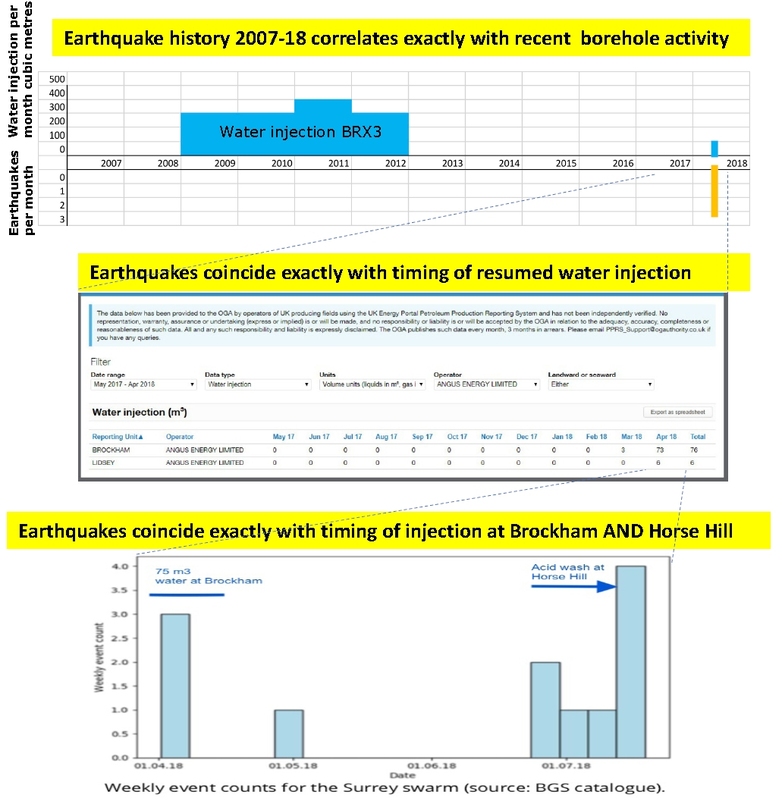 Time chart of Brockham injection compared with earthquake activity (bottom, from Steve Hicks) (click to enlarge). The diagram does not prove a causal link, but the coincidence is striking. There have been no more earthquakes now for nearly four weeks, since 2018 July 18, so if it can be confirmed that there has been no activity at Horse Hill since the last earthquakes, this would be additional evidence pointing the finger at Horse Hill. On the other hand, earthquakes may continue to be triggered for some time after the cessation of injection, so absence of further production activity since July 18 plus future earthquakes would not imply that injection or flow testing prior to mid-July was not responsible. In conclusion, the extreme shallowness of the Newdigate events means that we have a lot to learn about shallow pore pressure, shallow stresses, and shallow faults. The complex tectonic problem to be resolved here lies in the depth zone of the hydrocarbon activity. In view of the clear temporal and spatial relationship to the current exploration and production activity at the two sites in question, I support the call for a moratorium on further hydrocarbon activity made by four expert earth scientists. Letter to The Times, 2018 August 6, from four earth science experts (click to enlarge). This moratorium must last until such time as independent experts can explain what the link is, if any. The same group of signatories to the Times letter has also written in more detail to the Secretary of State at BEIS, calling for a moratorium. Business as usual should not be an option.